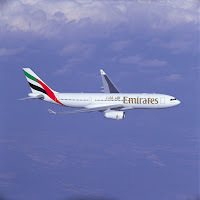 DUBAI, U.A.E., 12th May 2009 – The Middle East will once again get a boost from Emirates with the airline today announcing an additional 12 flights per week to major travel hubs in the region; bringing the airline's total number of weekly flights across the Middle East to 197. Effective 1st July, the 12 additional flights will serve five major Middle East cities including; Kuwait, Amman, Damascus, Sanaa and Doha; and all additional flights will be serviced by the Airbus A330. Emirates will introduce two additional weekly flights to Kuwait, two additional weekly flights to Amman, three additional weekly flights to Damascus, four additional weekly flights to Doha and one additional flight to Sanaa, making it a daily service. The additional flights bring the airline's total weekly operation to: 28 flights to Kuwait, 14 flights to Amman, 14 flights to Damascus, 32 flights to Doha and a daily flight to Sanaa. Emirates has an extensive Middle East network and currently flies to 14 cities across the Middle East each week. Further expanding its services globally, Emirates has this month commenced a daily service to San Francisco and Los Angeles. In addition to this, from June 1st the Emirates Airbus A380 will begin servicing Bangkok and Toronto and later in the year will service Seoul from December 1st. This month has also seen the commencement of a daily A380 service to Sydney and Auckland.